Faced with an urgent need to expand the capacity of Haneda airport ahead of the 2020 Tokyo Olympics, the government is planning to break a longtime taboo: routing flights low over densely populated residential areas of the capital and its suburbs. In a move called by one industry official “opening Pandora’s box,” the transport ministry is mulling changing flight path regulations so aircraft buzz as low as 1,000 feet (about 300 meters) above the ground as they descend into Haneda, which is located in Ota Ward and officially called Tokyo International Airport. 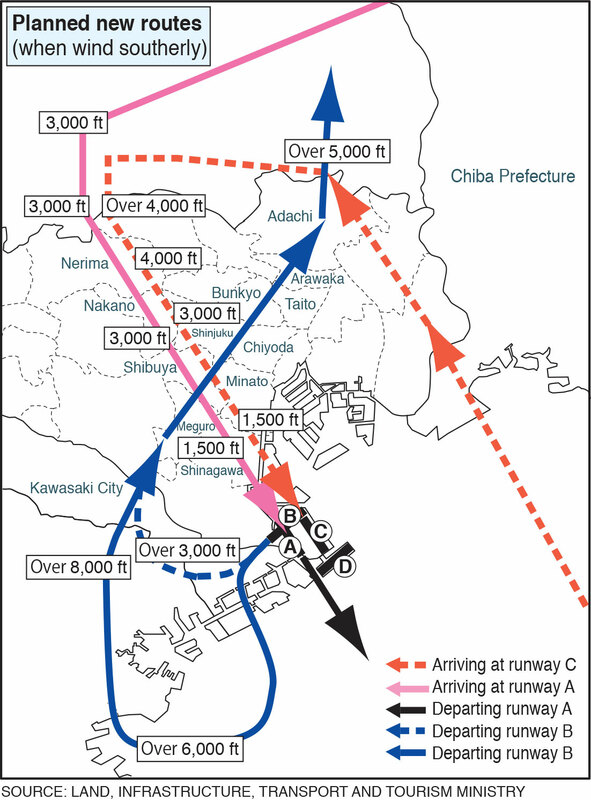 Currently the published, and controller initiated, traffic patterns for Haneda keep aircraft over Tokyo Bay, requiring landing planes to turn onto final approach before going over land and those taking off to turn away from land once sufficiently airborne. 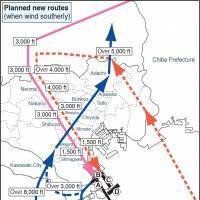 The planned flight path changes would route aircraft, during late-afternoon hours, over heavily populated parts of Tokyo, exposing people on the ground to aircraft noise and even the potential for accidents. Many residents of the megalopolis who may be affected by the change, however, have not been informed of the details of the plan and have no inkling to the noise they may be exposed to or whether they will need to take soundproofing measures. Some experts also worry that Haneda controllers — who already juggle constant heavy traffic within tightly regulated airspace — might be overworked to the point of risking a major disaster. The transport ministry’s plan, based on recommendations by a panel of experts last July, calls for boosting the capacity of the airport roughly by 10 percent in five years without adding new runaways. 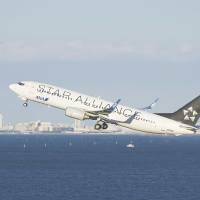 The four-runway airport, favored by many travelers over far-off Narita International Airport in Chiba Prefecture, is expected to handle 486,000 flights a year from the current 447,000 by 2020. The expansion is imperative not only to increase the number of inbound visitors to Japan but also to improve the metropolis’ industrial competitiveness over other cities in Asia, ministry officials say. To keep noise to a minimum, the new routes planned would be available only between 3:30 p.m. and 6:30 p.m.
During those hours, and when a south wind is blowing, however, up to 90 planes per hour would be directed to descend using two new routes over areas previously immune to noise pollution. Some of the flights would go over Shibuya and Shinjuku wards, for example, at an altitude of 3,000 feet (914 meters), while parts of Shinagawa, Minato and Ota wards would see aircraft flying at 1,500 feet (457 meters). Ministry officials and industry experts say there is nothing new about planes flying at low altitude over urban areas. In residential areas surrounding Osaka International Airport and Fukuoka Airport, planes fly over residential districts as low as 450 meters above ground, while New York and London host numerous airports in urban areas. In recent years, Haneda flights have started using smaller aircraft, lowering noise levels considerably than in the past, the officials and experts noted. Some communities are worried nonetheless. Shinagawa Ward, with a population of 358,000, was notified of the planned route changes in August. The ward assembly in December unanimously adopted a resolution asking the transport ministry to fully investigate the expected rise in noise levels and take appropriate action, including financial support for soundproofing measures if they become necessary for homes and public facilities. Shinagawa Municipal Assembly Chairman Hideo Ishida said the move would surely be contentious with the ward’s residents. “If flights start coming your way every two minutes, as opposed to none previously, residents will no doubt complain,” he said. In the Tonomachi area of Kawasaki, where homes and factories are clustered, Hiroyasu Aizawa, head of the neighborhood association that covers 1,000-plus households, said he wants a detailed explanation from the government, because his organization has not been briefed about the details of the new routes. A transport ministry official acknowledged that Tonomachi would be among the areas most affected. The ministry estimates up to 300 homes and dozens of public buildings, including schools and hospitals in the area, would probably need to be soundproofed. But it remains uncertain whether such measures would be covered by the government, since, according to the Noise Abatement Law, noise levels would be rounded off over a 24-hour period, he said. Because the new routes would be in use for only around three hours a day, average noise levels might not reach the legal limit beyond which the state is mandated to compensate for soundproofing measures, the official said, noting the government has yet to decide what to do with those heavily affected areas. At the heart of the flight route issue is long-standing friction regarding airspace controlled by the U.S. Air Force’s Yokota base in Fussa, Tokyo, some 60 km northwest of Haneda. The Yokota airspace encompasses areas over Tokyo and eight prefectures. The military airspace covers up to an altitude of roughly 23,000 feet (7,000 meters) at its northern part, and around 8,000 feet (2,450 meters) to 16,000 feet (4,880 meters) in its southern part of Tokyo. The airspace, towering like a giant, invisible wall, has forced commercial flights bound for western Japan and South Korea to make a big detour around Tokyo Bay and gain enough altitude so they can fly above the Yokota control zone. The Tokyo Metropolitan Government has for years demanded that the entire Yokota airspace be returned to Japanese authority so aircraft can save flight time and fuel, although the transport ministry’s report in July did not propose major changes to the airspace. “If the airspace is fully returned, it would shorten routes for Kansai- and Kyushu-bound flights, making them fly economically and in a more environmentally friendly manner,” said metro government official Takeshi Abe. Such views are echoed by Takuya Takahashi, secretary-general of the Japan Council of Civil Aviationworkers’ Union for Air Safety in Tokyo. 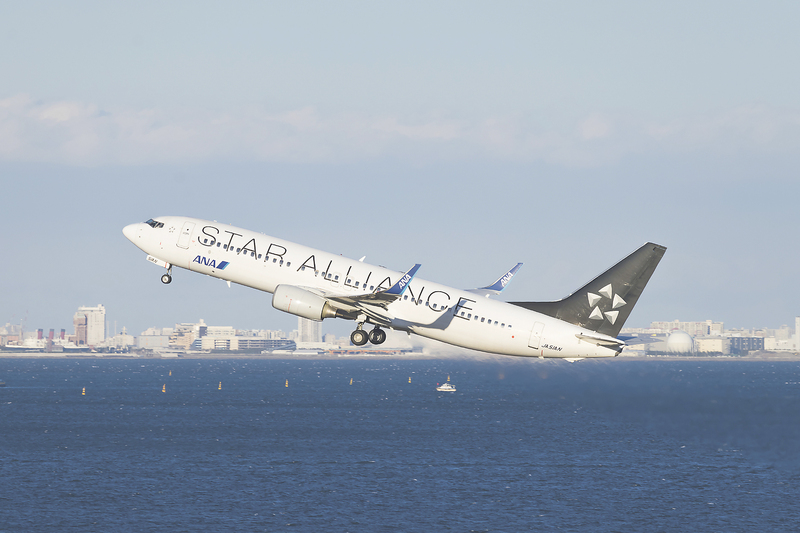 An acting pilot with a domestic airline, Takahashi said Yokota airspace restrictions have forced controllers and pilots using Haneda to maneuver within an extremely narrow corridor. Takahashi said Haneda is already jammed with traffic, noting that cramming even more flights in could threaten aviation safety and push airport workers to the breaking point. “Given the current runway layout and operations, increasing the number of flights would add a severe technical burden to the pilots and controllers,” he said. Aviation analyst Kazuki Sugiura, while commending the airport’s expansion as a “big step forward” to make Haneda internationally competitive, said the transport ministry should communicate more actively and transparently with the public to dispel any concerns. Last month, the ministry launched yet another advisory panel, this time to ponder how to communicate with residents to be affected by Haneda’s expansion. Made up of two university professors and a risk communications consultant, the panel will meet several times to come up with proposals “as soon as possible,” a ministry official said.